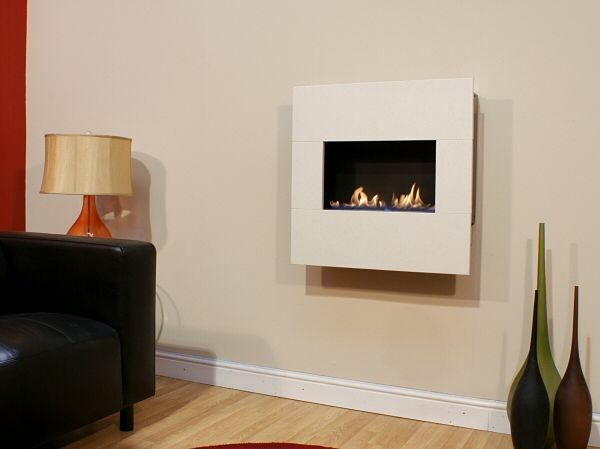 If you are looking for a modern fire for your new home, consider our flueless gas fires. A flueless gas fireplace is a perfect option for a contemporary property because there is no need for a chimney or flue system. As the fire burns cleanly, a flue is not needed at all, providing a simple layout, installation and build. 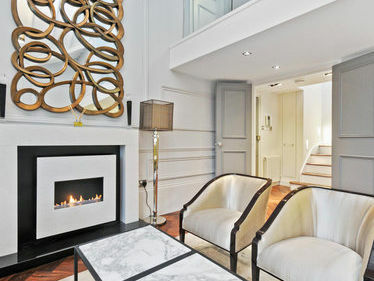 Yes, All of our flueless gas fires need to have an Air vent within the same room as the fire. Does your flueless fires need a catalytic convertor? No, Our whole range of flueless fires are clean burning and 99.9% efficient. Nope, Every fire in our flueless range does not need a flue and does not need to be wall mounted on a chimney wall. What are the benefits of a Flueless Gas Fire? Perfect solution for instant secondary heat for a living room or lounge. Why don't these fires have glass fronts? We are the only manufacturer who can offer a living flame flueless fire without the need for a glass screen which its purpose is to drive emissions through a cat convertor. We made our fires clean burning so we don’t need either. Why it is best to go Flueless? Energy Efficiency: All of the gas you burn is turned to heat and returned to the room. This means you are not wasting money. Saving Money: Despite all the hype in the media, gas is the cheapest form of utility to use being over 70% cheaper “per kw/h” of heat than wood, electric or bio-ethanol. Easy to Install:Wall Mounted versions can be installed very quickly if the gas supply is nearby. Easy to Use: Just turn the control knob top start and adjust the flame size and heat output.. Extra Heat when you want it: The reason for buying a secondary heat source for your home is for additional heat. A flueless gas fire will give you between 2.0kw and 3.5kw of heat and will cost you only 9p to 15p per hour to run. For the same amount of heat output an electric fire will cost you 30p to 53p. The flueless gas fires we manufacture have very unique features that other companies do not offer : open flame, no glass or catalytic filters. This means that the air circulating from our fire radiates out from the front and the top. 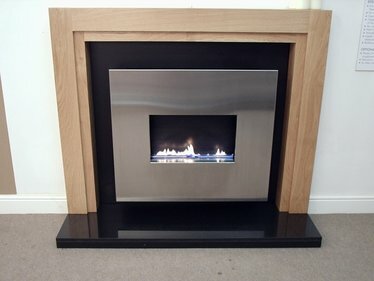 We have manufactured our own unique style of open flame flueless gas fires since 2003. Since then we have won many style and technology awards and the fire has appeared on many TV programs. To date there are many CVO flueless gas fires installed in homes and commercial properties across Europe. 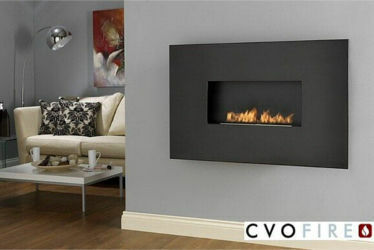 At CVO Fire we specialise in manufacturing Flueless Gas Fires with a beautiful open flame. My gas fitter says Flueless Fires are not safe. Yes, but if you ask the same gas fitter if they would fit a gas cooker for you they will say yes! That is despite a gas cooker having no safety devices fitted and being more dangerous than a flueless gas fire. A cooker and flueless gas fire both have a flame – so how can one be fitted and safe but the other not and unsafe? Unfortunately there are a lot of gas fitters who do not have a clue about the appliances they are supposed to fit in homes. This is why we ask you to call and we will give you the name of a proper gas fitter. All flueless gas fires sold in the EU have an ODS pilot system. This is a due safety device which will shut off the gas to the main burner if there is a problem. The CE standard says this must operate if the CO in the room reaches a maximum of 80ppm. Our fires shut off at around 25ppm. When you consider a smoker has over 100ppm in their breath you can see how small and sensitive this is. If the fire is installed in a room smaller than the minimum and with the wrong air vent or a blocked vent it will shutdown approx 1 hour or so after being started. This can sometimes lead people to think the fire is faulty however it is indicating an installation fault. Another indication of an installation fault is that the fire stops then later will work perfectly again. Do not use the fire and get a gas engineer to check the complete installation against the manufacturers instructions. Flueless Gas Fires have an outstanding safety record because they are designed to burn incredibly cleanly. Most manufacturers use filters or catalytic converters to clean out the emissions however the CVO gas burner technology has taken this a step further and our flueless gas fires burn so clean no filter is required. A CVO Flueless Fireline was installed in a Central London Restaurant in December 2003 and worked continuously until the restaurant was closed in May 2007. This fire operated for typically 15hrs/day, 6 days a week for 41 months = 14,760 hours. This is equivalent to nearly 25 years operating in a domestic property. The Flueless Gas Fire has only recently been introduced in the United Kingdom market, but is one which has been sold in countries such as Australia , Japan , and the USA for many years. Such is the success in these countries that it now outsells conventional chimney appliances. A flueless gas fire can be used to heat limited use areas or rooms in which some other forms of heating would be difficult or expensive to install such as basements, room extensions and conservatories however there must be a primary heat source also in that room. 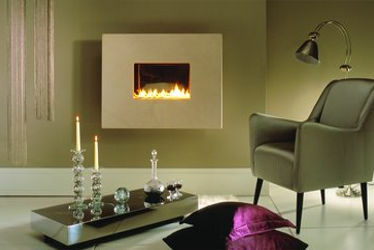 A flueless gas fire can be installed almost anywhere, even on an inside wall. A Flueless Gas Fire works in an opposite way to a conventional gas fire as the heat is distributed gently throughout the property. The vent supplies air into the room which is being heated. This air then circulates in the property giving additional warmth. Do Flueless Gas Fires Cause Condensation? A myth created by people who do not understand the technology is that a Flueless Gas Fire will cause condensation in your house. This is untrue. Flueless gas fires are a secondary heat source, working with your central heating system. The background air temperature prevents most of the moisture from condensing and it is dispersed by normal air movement. It means “parts per million parts”. During the CE tests this is measured at the outlet of the appliance in a very concentrated sample direct from the burner. Once this has been diluted by the oxygen in the room the CO concentration is tiny and very safe. What Safety Devices are fitted to the fires? All modern flueless gas fires manufactured and sold in the EU have an ODS pilot system fitted. This special part monitors the oxygen levels in the room. If the air vent is blocked the ODS will shut off the fire long before there is an issue over the emissions. For instance our fire shuts down at only 25ppm, the CE maximum is 80ppm and it is reported that exposure to CO of levels of 800ppm and higher are considered hazardous. Most CO alarms go off at 36ppm to 99ppm when sampling the concentration in the room. This means your cvo flueless gas fire will go switch off “before” the CO alarm goes off. What are the main installation requirements for Flueless Gas Fires? Air Vent. This will allow a trickle of fresh air into the room. A common mistake made is that people think it takes air (and heat) from the room, it does not. The vent supplies a tiny amount of fresh air. Modern air vents include baffles and cowls to prevent any drafts. We can supply a modern air vent with your gas fire purchase. Gas Supply. The gas pressure must be maintained at the manufacturers stated level or the combustion will change. Room Size, there will be a specified “minimum” room size. The room can be bigger than this, but not smaller. When taking account of the minimum room size it is the height x depth x width in meters – giving a m3 result. Also make an allowance for the amount of furniture in the room. What makes our flueless gas fires different? They are handmade in the UK using locally sourced materials. Every fire is individually handmade and tested for up to 1 hour before being packed and shipped. Our fire does not need catalytic converters so also does not need glass on the front, leaving a beautiful open living flame. How can they be safe, where do the emissions go? Flueless gas fires are very safe. About 20 million are installed in the USA and they can be found in Australia and Japan – two countries with strict environmental laws. The emissions from these appliances are very small. The fire needs an air vent in the room. This vent provides fresh oxygen to replace the oxygen burnt by the fire and keep the air fresh. You should also consider that as a manufacturer our factory is inspected each year by officials from CE to ensure we are making products to the exact standards set our by EU law. Additionally, every month we do our own internal audit on our appliances and we also test the components when they arrive at the factory and before we build the fires. This is what makes our fires the most safe and reliable on the market. The fire also has a safety device. This will shut the fire off if someone tampers with the fire or the air quality is reduced. Our fire shuts down at only 25ppm and it is reported that exposure to CO of levels of 800ppm and higher are considered hazardous. The emissions from a wood burning appliance are much higher than a flueless gas fire (they can be up to 50x greater). If they are installed with a faulty flue system or the door seal is damaged these emissions will come into the room. Wood burners do not have ab ODS system, hence why it is law to have a CO monitor with a wood burner. Why do I need an Air Vent? The fire burns oxygen from the room to ensure that the flame is clean. As the fire uses a small quantity of the air from within the room this must be replaced by fresh air supplied by the wall vent from outside. If the air vent is the wrong size and does not supply enough air or becomes blocked all together after a period of time the volume of used air will reach a level where the pilot will operate to shut the fire off. This is normally shown by an increase in noise from the pilot. This is why every flueless gas fire has a minimum room size and a minimum specified volume of “free air” that must be supplied in to the room. We supply high quality vents for around £40 that ensure you do not get drafts, it is just a trickle of fresh air. You must never block the vent up otherwise the safety device will operate and shut the fire down. Will I get a Stain on the Wall? Without the catalytic convertors and glass screen it means the emissions from our fire are diluted quicker by the fresh air. With other brands of flueless fire the vent on the top of the appliance can concentrate the heat into one fixed outlet area and cause stains on the wall directly above the fire : our fire does not do this. How do the Running Costs of Flueless Gas Fires compare with other types of Fires? When replacing a conventional or balanced flue gas fire with a flueless gas fire you will lower your overall gas bills by up to 70%. The annual cost of using a flueless gas fire is around £50/year, compare this to an electric fire of £150/year or burning wood at £500/year for the same heat and you can see why so many people choose flueless gas fires. When considering other appliances, with safety in mind, you should also consider that the emissions from a wood burning fire are very high and these appliances do not have a safety device to shut them down. The dust particles have also been proven to be very hazardous. Wood burning fires may seem glamorous however when considering your family’s health great consideration should be put into researching the health hazards of burning wood first. Does a Flueless Gas Fire cause smells in the room? If it is installed correctly, with an air vent in the room, and operated as instructed then NO. As described above the fire uses fresh air from the room. If the air quality is poor then this poor quality air will be drawn into the fire and burned causing a smell. Whenever the cause of smells has been investigated it has not been the fire but by people doing something to the air quality or changes in the home. Examples are: burning scented candles, using air fresheners, decorating, new furniture, spraying aerosols, new carpets etc. What is the Fuel Efficiency and Economy? The energy efficiency of a Flueless Gas Fire is 100%. This is partly because there is no flue or chimney through which heat can escape and this means that all the heat remains in the room. As a result running costs are very low. This is a considerable saving for the householder. A conventional Chimney or flue set up draws a large amount of air from a house. This means the heat generated by Central Heating systems, when the fire is not in use, is also being lost up the chimney. With a Flueless Fire this situation does not occur. Can I Install a shelf above a Flueless Fire? 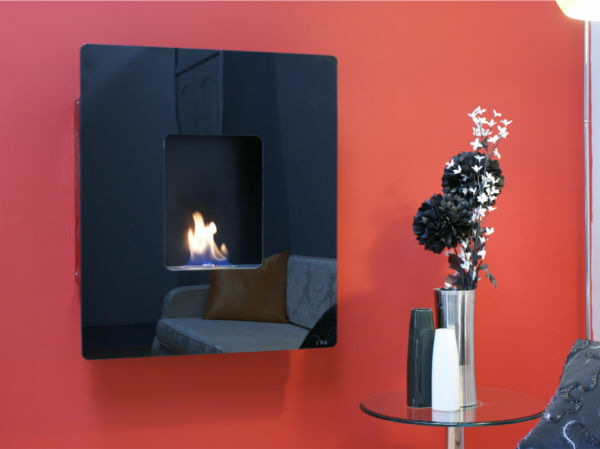 Flueless gas fires are designed to be wall mounted. Mounting anything above the fire must be done in line with the CE approval. 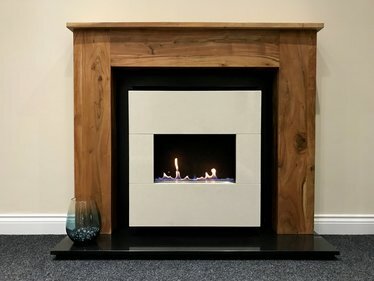 The fires that we sell are approved with a special deflector which allows a shelf above however this must be done in line with the installation booklet. This deflector must be ordered at the time of ordering the fire. Please ask for details. 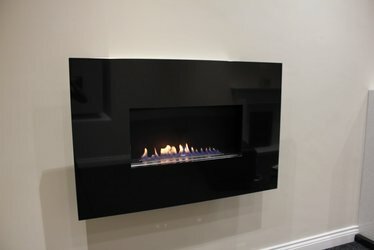 Can I Install a Flueless Fire into a wall? 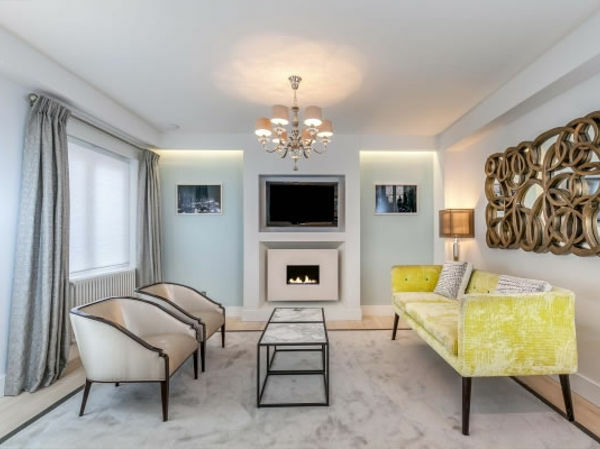 Flueless gas fires are designed to be wall mounted however the CVO flueless gas fire is also approved as a recessed version which has allowed customers to install the fire into the wall. Please ask for details.